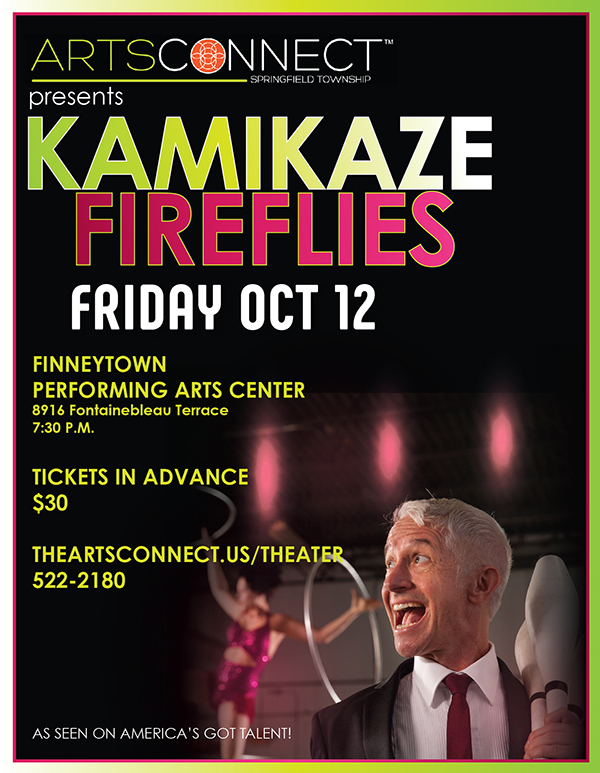 Kamikaze Fireflies will bring their modern vaudeville act to the Finneytown Performing Arts Center stage in Springfield Township on Friday, October 12, at 7:30 PM. Whether spinning gigantic metal cubes, juggling, stilt-walking, performing daring stunts, breathing fire, breaking into contortionist backbends, or making a sandwich using only their feet, the two-person modern vaudeville act Kamikaze Fireflies instigate mischief, awe, and laughter for the entire family. Created by and starring Casey Martin and Rob Williams, Kamikaze Fireflies have performed at numerous international events, including the Uptown Comedy Festival in Canada, the Festival of Fools in Northern Ireland, and the Adelaide Fringe and Melbourne Comedy Festival in Australia. Martin and Williams have also performed at many universities and comedy festivals across the United States, and were featured on the television show America's Got Talent. A portion of each ticket price benefits an educational outreach to schools serving Springfield Township. That's right, not only will you be experiencing a night of entertainment, you will be supporting an afternoon show designed for our local school districts. ArtsConnect is offering 50 FREE daytime show tickets to each public high school for their students to experience "History of Vaudeville". This offer has been made possible to Finneytown, Mt Healthy, Winton Woods, Princeton, Cincinnati Public, North West and North College Hill. *Tickets at the show are not guaranteed on campus parking. Please purchase tickets in advance.